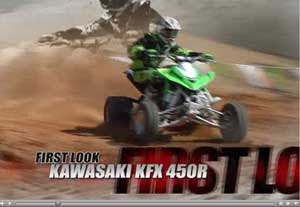 Some great video of the Kawasaki KFX 450R just put up on ATVTV.com. This is not a test evaluation by Doug Meyer, rather more of a chance for Kawasaki to market their cool work. We know from comparisons, all these advantages on paper don't seem to stack up. Warning - a very large video including lengthy ads in front. But like I said, some great footage.